Would you ever have guessed that one of the biggest melting pots of Russian life in Berlin is not located on former GDR territory, but in the deep West? The Charlottenburg area was established as a Russian district as early as in the 1920s, as many who fled the October revolution settled down in that part of Berlin. It soon received the nickname “Charlottengrad”. Later on, during the 1990s, the former refugees were joined by immigrants coming from all over the collapsed Soviet Union. Until today, you’ll find many Russian businesses in this area. 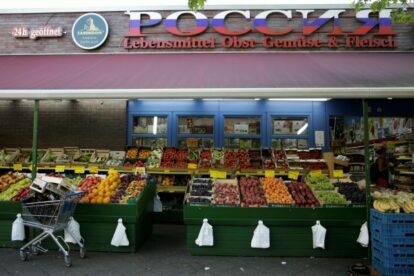 Among those, the most famous one is the supermarket Rossia (or actually Россия, simply meaning “Russia” in Russian), hidden at the last end of the Charlottenburg S-Bahn station. 24 hours, seven days a week, you will find all different kinds of clientele. From little Babushki filling up their shopping trolleys with smoked fish and frozen pelmeni, to rich Russian ladies parking their expensive cars in front of the shop and sprinting inside on their high heels shoes to quickly pick up some vodka for the next party. Being very fond of Russian culture, this is a great place for me to practice the language or pick up some delicacies I got to know during my trips and through Russian friends, or try out new ones. Even if you have not been to Russia yet, Rossia is a very interesting place, even if you are just really in need of juicy Uzbek tomatoes at 3am.